Enermax, so far known for its power supplies, fans and coolers, has decided to offer something new out of the company’s factories – the first Enermax liquid CPU coolers. The new Enermax products are three and belong to the ELC series. Right now there are three liquid coolers only – the ELC120-TA, the ELC-120TB and the ELC240. All of them come equipped with a patented Enermax technology for better thermal conductivity. In addition the three coolers offer an all-in-one, close-loop system to prevent the complexity and hassle of DIY water-cooling kits, which means that every user out there can install the cooler inside the PC case. Finally the liquid is tightly closed so there’s no need to refill the water coolant or perform any maintenance work for the lifetime of the cooler. Depending on the model the coolers come with different cooling fans. The ELC120-TB and the ELC240 are equipped with T.B.Silence fans, while the ELC120-TA comes with two T.B.Apollish LED fans. There’s fan speed adjustment too with users being able to choose among three different settings. 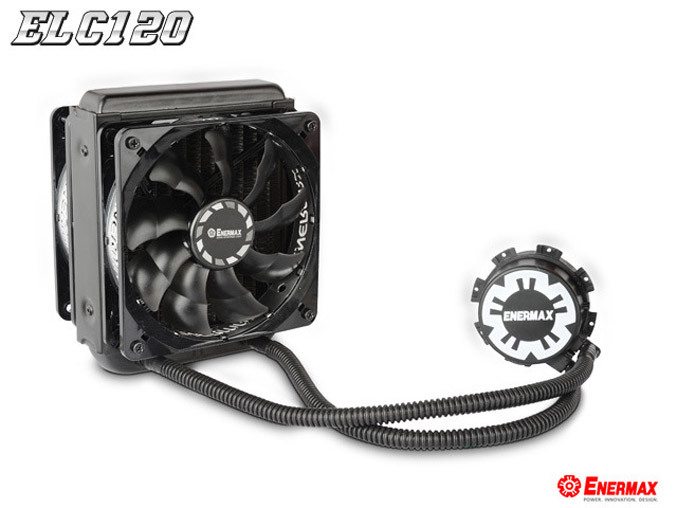 In Silent Mode the fans spin at 1500 rpm, while in Overclock mode the rotation goes up to 2200 rpm. The new Enermax coolers support all modern Intel and AMD processors. The ELC120-TA sells for 89.99 USD, while the ELC120-TB and the ELC240 cost 89.99 USD and 119.99 USD respectively.